Controlling costs and increasing efficiencies are two fundamental drivers for outsourcing of pharmaceutical manufacturing. Use of integrated contract development and manufacturing organizations (CDMOs) that can support projects from early-development phases through commercial production reduces timelines and costs by facilitating scale-up and technology transfer. With the addition of Olon Ricerca Bioscience, Olon S.p.A. now offers end-to-end support for the development and manufacture of chemical APIs and intermediates. Olon S.p.A. is a world-leading advanced intermediates and small-molecule active pharmaceutical ingredient (API) contract development and manufacturing organization (CDMO) and generics supplier, with headquarters and seven manufacturing facilities located in Italy and one in Spain. Our company also has subsidiaries in the U.S. (Olon USA Inc.), Germany (Infa GmbH) and China (P&R Shanghai—International Trading Co. Ltd). In June 2017, we significantly broadened our service offering with the acquisition of the Chemical Division of U.S. CDMO/contract research organization (CRO) Ricerca Biosciences. The business was renamed Olon Ricerca Bioscience LLC and continues to operate from its Concord, Ohio location. With the acquisition of this research and manufacturing base in the U.S., Olon has added new early-phase CDMO capabilities and expertise, while also gaining additional access to the American market. Olon Ricerca Bioscience, in turn, has gained access to large-scale manufacturing capabilities in Europe. As a result, we have broadened our overall contract research, development and manufacturing services for all of our global customers. Olon Group, as a whole, has the ability to support customers from early-phase development to commercial production and to produce milligrams to tons of material. Today we can support the full development and production of chemical intermediates and APIs, including new chemical entities, from preclinical to phase I-II at Olon Ricerca Bioscience and phase III and commercial production at our facilities in Europe. With internal technology transfer there is no need to work with an external organization; there are no confidentiality issues and the process can be implemented seamlessly using the same technologies within the same quality and management systems. 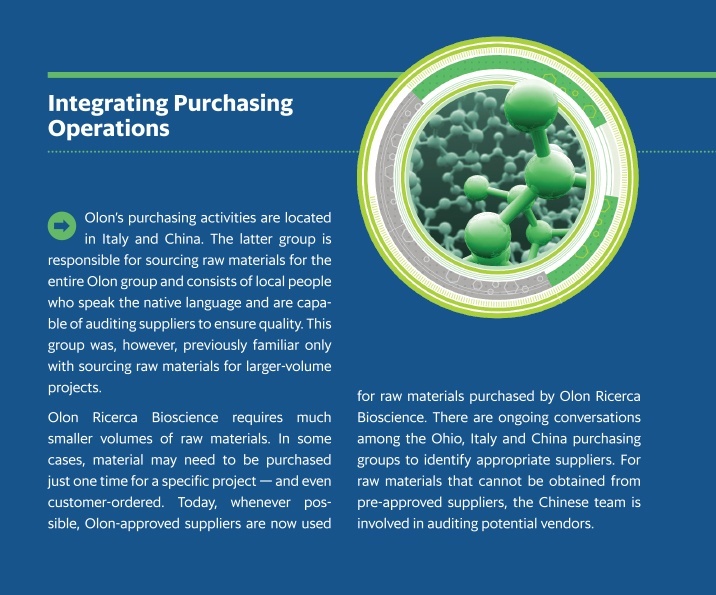 Olon Ricerca Bioscience is recognized as a very reliable U.S.-based CRO/CDMO supporting the development and manufacture of APIs and performance materials for clinical studies, market development and commercial distribution. Our highly experienced scientific team has a proven history of achievement with complex chemistry challenges, providing a complete solution for any small-molecule chemical development need and creating synergies that accelerate first-time scale-ups and the subsequent development of safe, reliable, robust and cost-effective manufacturing processes. Our scientists also offer synthetic and process chemistry services such as process research and route selection, stable labeling synthesis, metabolite/degradant identification and synthesis, synthesis of analytical reference standards and much more. In addition to these capabilities, Olon Ricerca Bioscience provides a comprehensive range of on-site analytical chemistry services (both stand-alone and in support of projects) to fully support the drug development process — from preclinical to post-marketing phases for both drug product and drug substance. As part of Olon Group, we can also guarantee our clients long-term partnerships that include large-scale manufacturing capabilities in Europe at eight FDA-inspected manufacturing plants. In addition, access to Olon’s skilled regulatory team, who manage more than 350 DMFs in over 70 countries and have established experience in global regulatory and quality procedures, allows Ricerca Bioscience to support both large pharmaceutical companies seeking specialized services and/or complementary capacities and small and midsized pharmaceutical firms that have limited manufacturing infrastructure and rely on CDMOs for a range of services, including regulatory filings, quality assurance, procurement and supply management support. The combination of the CRO/early-phase CDMO services of Olon Ricerca Bioscience in the U.S. and the late-stage and commercial CDMO offerings of Olon in Europe benefits both organizations and our customers. Olon Ricerca Bioscience is building on its excellent reputation. The strong financial stability of the Olon Group and the commitment of our owners to continued growth make use even more appealing to customers. They can be assured that any projects started by the company will be completed and that the same procedures and quality systems are in place from the earliest development stages through commercial manufacturing. Olon Ricerca Bioscience can now also rely on the deep regulatory expertise and experience that Olon has in preparing DMFs, which it has completed for more than 150 APIs in the U.S. market. The close relationships that Olon has established with the global regulatory agencies will facilitate future filings for the U.S. organization. The portfolio of technologies that Olon Ricerca Bioscience can offer to its customers has also been expanded. Examples include fermentation, recombinant peptides, the performance of hazardous chemistry and new technologies such as fluorination and carbonylation reactions and the production of highly potent APIs. The European CDMO business, meanwhile, benefits from not only the added ability to offer early-phase development and manufacturing capabilities to its customers, but also the addition of the strong, stand-alone analytical services (i.e., impurity and polymorph identification, etc.) offered in the U.S.
Training of our commercial team is underway to ensure that all members have a detailed understanding of all of the capabilities of the company as a whole. Acquisitions require integration, of course, and integration is always a delicate/challenging process. With the integration of Olon Ricerca Bioscience into the Olon CDMO operations, we melded different company organizations with different cultural environments and business approaches. The companies not only were of different sizes, but also had different business architectures and were focused on different commercial targets within the drug development cycle — small, early-phase projects for Olon Ricerca Bioscience and large-volume and commercial projects for Olon. To overcome these challenges, starting on day one, we established a plan to pursue ongoing interactions between the two organizations with the intent to understand these differences and identify the best approaches to adopt that would benefit the entire group. We first had to understand the two types of targets and determine how best to implement the Olon ap-proach to customer service. We also needed to migrate all of the Olon Ricerca Bioscience financial, information technology and purchasing systems to those used by the Olon Group. Olon’s Corporate Quality System (procedures, inspection protocols, internal auditing, etc.) was also implemented across Olon Ricerca Bioscience operations to ensure that all projects are managed under the same conditions. A plan for an FDA pre-approval inspection at the Ohio facility was also initiated in preparation for the approval of an API that will be produced at the site and sold in the U.S. API market. Just as important, we instituted daily information exchanges between the R&D groups in Ohio and Europe. This ongoing discussion ensures that regardless of where our customers are located or which services they are seeking, all of the technical groups are familiar with the full range of technologies and capabilities of the entire organization, from analytical services at Olon Ricerca Bioscience to commercial contract manufacturing in Italy. In addition, the project teams in Italy and the U.S. are both involved in the evaluation of requests for proposal and preparation of a combined offer for potential customers. Exchanging information is crucial for this process to be implemented efficiently and effectively. Another aspect of our approach to the integration of Olon and Olon Ricerca Bioscience is the formation of our One Olon Commercial Team and the centralized management of global accounts and key customers. The goal is to enable the identification of potential benefits for our customers that would not be realized through a compartmentalized commercial strategy. Customers, wherever they are located and whatever projects they are focused on, will be served by one commercial team with knowledge of the offerings (technologies, capabilities and capacities) of Olon Ricerca Bioscience, the Olon CDMO group in Europe and the Olon USA and European generics businesses. Customers are presented with information about our full range of services, from our generic API offerings to our stand-alone analytical services, because in many cases technologies and capabilities in one area may be applicable in another. For instance, one of our generic APIs with minor modifications may be suitable as a raw material for a new chemical entity being developed by a potential customer, which could lead to significant cost and time-saving. Similarly, it may be easier to modify an existing analytical method rather than start from scratch. In a similar vein, key account managers will be responsible for global accounts, with the different commercial teams reporting to these centralized managers so that an organized and comprehensive offer can be made for all worldwide services. The CDMO Division of the Olon group has implemented a Five Strong Pillars approach to ensure that we consistently meet or exceed our customers’ expectations. Olon Ricerca Bioscience is in the process of adopting this approach. Excellent customer service requires an in-depth understanding of the customer’s needs. Across the Olon Group, flexibility is also essential because projects may be initiated at any of our sites but require support from different or multiple locations. Cooperation is, therefore, also fundamental to achieving QOTIF. Having the same quality system across the entire group provides assurance to our customers that their products will be produced to the same exacting standards throughout the lifetime of each project. On-time delivery, in essence, involves providing our customers with the services they have asked for. Olon Group, as a whole, has the ability to support customers from early-phase development to commercial production and to produce milligrams to tons of material. These capabilities are backed by the strong financial stability of the company. We are also interested in being strategic partners with our customers and are committed to forming long-term, risk-sharing, win-win relationships. Our management approach involves the use of dedicated project teams that support each project from start to finish. This approach allows for excellent communication and the building of strong relationships between Olon scientists and our clients. We have, in fact, had many customers that bring us repeat business, where clients specifically request the same project teams. The security of customer information is absolutely essential. At Olon, we take this issue seriously and have procedures in place to ensure that security is maintained at all times. In addition to our dedicated project teams, we have separate teams for our generics and contract manufacturing businesses. Our information technology and informatics systems are also designed to protect customer information. Further, we cooperate with our customers to ensure that appropriate measures are implemented to protect their information. Cost management is always an issue for any business and it is of particular concern today for the pharmaceutical industry. Because Olon is involved in the generics market, where competition is largely based on pricing, we have gained experience in achieving cost-effective production methods. 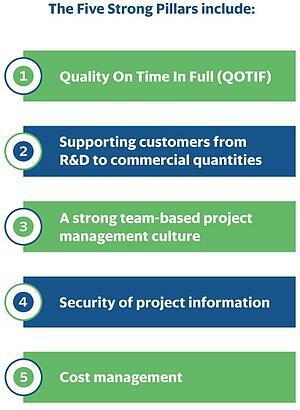 This experience is then applied to projects implemented by our CRO/CDMO businesses to the benefit of our customers. 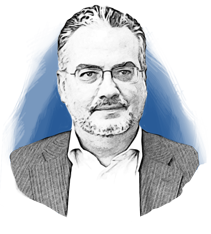 Luigi Trussardo is the CEO of Olon Ricerca Bioscience, a US-based CRO supporting the development and manufacture of APIs and performance materials in support clinical supply, market development and commercial distribution. He has more than 30 years’ experience in the pharmaceutical industry and healthcare business, working for multinational companies in the field of clinical diagnostic, medical devices and fine chemical business. Luigi received a BS in biology from Milan University.